The best part about Charlie and the Chocolate Factory in the last few days has been talking to other people who've also seen it. It's totally a "favorite lines" movie, where there's nearly as much enjoyment to be had in rehashing the best bits as there was watching it the first time. You're like fellow members of a not-so-secret club where the password is "I like grapes!" or mentioning the doll and puppet burn ward. 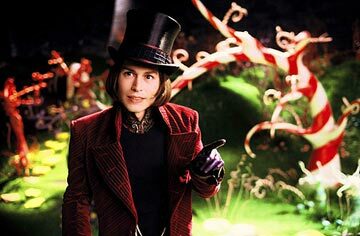 Director Tim Burton and his marketing team have been very pointed in insisting that Charlie and the Chocolate Factory is not a remake of the 1971 musical Willy Wonka and the Chocolate Factory but rather a new adaptation of the book. But if he had not been able to conjure up his own weird world in classic Burton fashion, it all would've been movie marketing hot air. Johnny Depp's performance alone is worth the price of admission. His facial expressions are priceless. They almost could be the work of a silent film actor, they communicate so much. If only we could make a flip-book of some of his reactions. We want to watch this movie about fifteen more times and take people to it who haven't seen it yet, so we can nudge them and whisper, "get ready, this is the best part" throughout. Which is probably really annoying, but CC wouldn't be able to contain ourselves. Charlie is a movie overflowing with goodness that fills us with good will for the whole endeavor of moviemaking.